Guaranteed Title or Your Money Back! not be available after auction bidding is opened. The Rattlesnake Bar claim (on the Klamath River) is located about 26 miles downriver from Happy Camp. 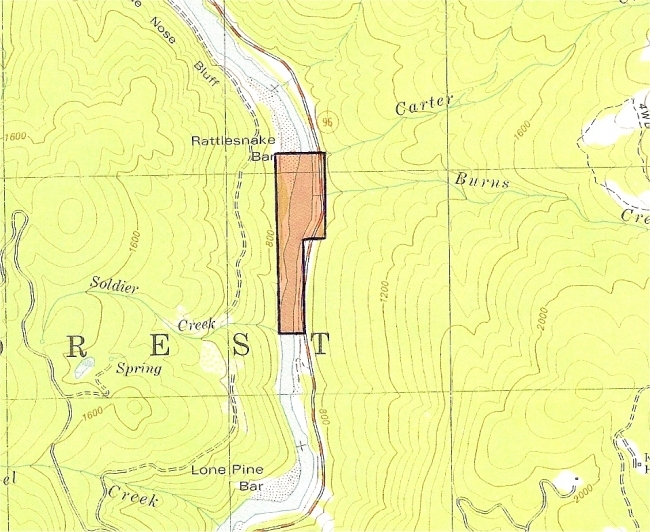 The upriver boundary is located at Highway 96 mile marker 14.74. at Carter Creek. Look for a red blaze on a tree on the embankment-side of the highway. The downriver boundary is located where Soldier Creek enters the Klamath, across the river from the highway. Look for an orange and white metal stake at the end of a guard rail on the river-side of Highway 96. PROSPECTS : The Klamath River has a very rich mining history. This gold property location is no exception. Evidence of old hydraulic and bench mining can be seen throughout the immediate area. Three very exciting, large natural natural riffles are clearly visible from the highway along this beautiful claim. 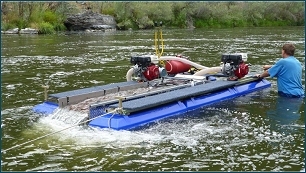 These riffles provide excellent shallow dredging opportunities. There is a long stretch of shallow water with a bunch of big boulders almost certain to be resting on the bedrock. Excellent highbanking areas exist along this claim, especially on Rattlesnake Bar.